3. 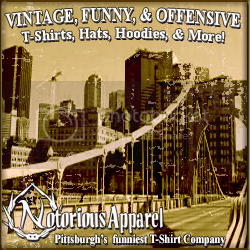 Create and add your links to NOTORIOUS APPAREL and CafePress. ALL Banner images are saved in PNG or GIF format. Should you need another format or size simply contact us at notoriousapparel@gmail.com and we can send you another format or size to replace in the code you'e chosen. Try different banners in different areas, see what works best for your website, blog, myspace, or forum signature. And be sure to stop back every now and again as we will be updating and adding new banners often! Should you need assistance don't be afraid to contact us at notoriousapparel@gmail.com for any assistance we may be able to provide.